Pink: There! On the horizon! Could it be … my long-lost love? Or maybe … an ice-cream truck? Polka Dot: Her hat looks delicious. Maybe I can make some bet I can lose? “If that isn’t an ice-cream truck coming, I’ll eat your hat?” Worth a shot. Inexplicably Tiny Person: Now! While my guards are distracted, I’ll activate the teleport! Soon I will beam up, away from this place of monstrous hungry women! Pattern from CloesCloset on Etsy. Really nice pattern. I would like to try my hand a it, albeit not this 35B one. Her hat DOES look delicious! What a great (70s?) 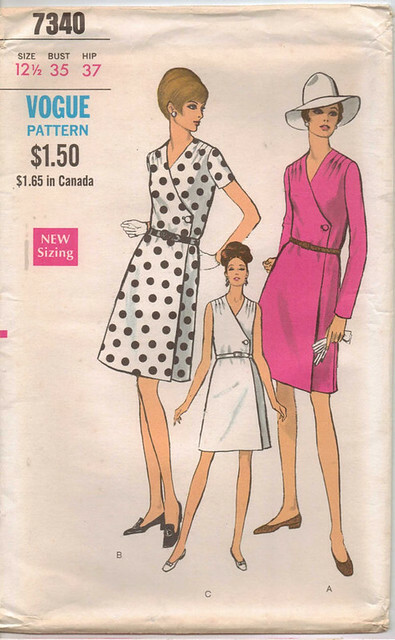 pattern: wrap front, shoulder pleat/gathers, plain sleeves. Oh, and sensible shoes, so you just know this was marketed toward tweens and their grandmothers! Gloves and a hat. Man, that takes me back! I wore my hair like Polka Dot when I was in high school … I wear it like that now, (harrumph harrumph) years later.